By the end of August, Carnegie Mellon University will have awarded seven doctoral degrees to students from the Department of Philosophy. The Dietrich College of Humanities and Social Sciences' Philosophy Department is known worldwide, particularly for its strengths in logic, mathematical tools and an interdisciplinary approach to real world problems. It's rare to have as many as seven doctorates awarded from this close-knit department in one year. From the ethics of democratic voting, to statistical analysis of biomedical data, to efforts that redefine the foundations of mathematics, these new graduates will be continuing to make contributions to research and education in the areas of philosophy and mathematics at institutions near and far. Here is a preview of where the graduates will apply their work next. Among Bright's many interests is the underrepresentation of minorities in the study of philosophy. He has written on the subject and was among the founders of the Minorities and Philosophy organization, an international group addressing minority participation in academic philosophy that is made up of 104 chapters, and growing. Bright's thesis work is centered on "social epistemology, with a focus on using formal methods to understand how the social structure of science affects our ability to produce and disseminate knowledge." Bright will be an assistant professor of philosophy at the London School of Economics, where he earned a Master of Science in the Philosophy of Science in 2012. 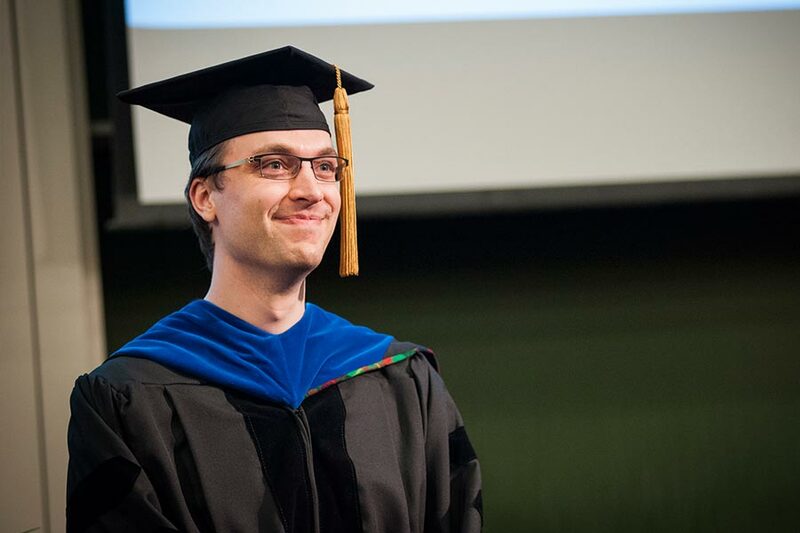 Konstantin Genin (DC'15) first received a Master of Science in Logic, Computation and Methodology and will soon defend his dissertation to complete his doctorate. Prior to CMU, he built models for macro-economic forecasting at the Federal Reserve. "CMU's Department of Philosophy is at the forefront of the foundations and methodology of science, which made it particularly attractive to me," Genin said. Genin’s areas of specialization are the philosophy of science, epistemology, machine learning and the philosophy of statistics. While at CMU he taught Causation, Law and Social Policy with Richard Scheines, dean of the Dietrich College, as well as introductory courses in philosophy and political philosophy. In 2017, he coauthored "The Topology of Statistical Verifiability" with his dissertation advisor Kevin T. Kelly in the Proceedings of the Sixteenth Conference on Theoretical Aspects of Rationality and Knowledge. Genin will present "Topological epistemology of science" with Kelly in the Explorations track of the North American Summer School on Logic, Language, and Information (NASSLLI 2018) at CMU in June and will then begin a post-doctoral research position at the University of Toronto. Aidan Kestigian was drawn to CMU's Philosophy Department for its interdisciplinary approach to academic work. "There were five doctoral students when I started. In philosophy, it's unusual not to have master's students in the mix. We all took the same classes at first, and it felt very much like a cohort model," Kestigian said. Her research focus is democratic theory and applied ethics. Her website provides a link to her dissertation prospectus: "Democratic Voting and the Common Good." At CMU Kestigian was a fellow at the Eberly Center. She taught seven philosophy courses including “Automation, AI and Society,” a new course she developed and co-taught with post-doctoral fellow Máté Szabo (DC'13,'17). She also received both the 2017 Dietrich College Graduate Student Teaching Award and the university’s 2018 Graduate Student Teaching Award. As graduation neared, she received a unique offer from Tufts University. She recently started a full-time position there as a program manager for two research centers, the Metric Geometry and Gerrymandering Group and the Science, Technology and Society Program, where she will have a hand in both research and curriculum design. Rob Lewis can recall a feeling of relief during his first week at CMU when another student gave his group help on an assignment for their core Formal Methods course. "The kindness probably stopped a few of us from dropping out," he joked. Lewis shares an interest with other cohort members in the study of logic and the foundations of mathematics. His specific interests are in the formalization and computer verification of mathematical proofs. His dissertation was titled "Two Tools for Formalizing Mathematical Proofs." "I appreciated that, even though my work is in a mathematical field, CMU encouraged me to think about it from a humanitarian perspective as well," he said. Lewis would like to contribute to developing new proof search techniques for mathematics that make the process of formal verification easier. In January he began a postdoctoral research position at the Vrije Universiteit Amsterdam. He is involved in the Matryoshka Project, an effort to improve proof assistants through automation. Daniel Malinsky started work at CMU on causal inference from observational data that he plans to continue developing as a researcher. He also became part of an algorithm development and data science research group in the Center for Causal Discovery, an NIH-funded center focused on using big biomedical data to discover new insights in health. He is now a postdoctoral fellow at Johns Hopkins University where his work lies at the intersection between computer science and biostatistics. "When I was studying in CMU's unabashedly interdisciplinary environment, I was encouraged to think about problems from so many different perspectives without any 'ideological blinders,' as [Alumni University Professor] Clark Glymour would call them. This has been important to my research and to communicating effectively to different academic communities," Malinsky said. While at CMU, Malinsky published journal articles, including the 2017 article “Estimating bounds on causal effects in high-dimensional and possibly confounded systems” with Professor Peter Spirtes. Originally from the Netherlands, Egbert Rijke came to CMU based on his research interest in homotopy type theory, and to study with Philosophy Professor Steve Awodey. The relatively new theory has the potential to form a new foundational language for mathematics. Rijke helped to coauthor a book on it during a year at Princeton University's Institute for Advanced Study prior to his arrival at CMU in 2014. Written by a group led by Awodey, Thierry Coquand, and the late Vladimir Voevodsky, their book "Homotopy Type Theory" is available online. Quanta magazine discussed the theory in this article. Collaboration is important to Rijke and an aspect of CMU that he appreciates. Another rewarding CMU experience was to design and teach a course on homotopy type theory. "There has never really been a course on this subject anywhere in the world before. I did not know what to expect from my students, but they picked up the new concepts wonderfully," he said. Rijke will now be a postdoctoral fellow in mathematics at the University of Illinois at Urbana-Champaign. He looks forward to continuing his research and working under faculty members Daniel R. Grayson and Charles Rezk. Floris van Doorn came to Carnegie Mellon after studying mathematics at Utrecht University in the Netherlands. "I wanted to continue my studies in mathematical logic, and CMU has a very good reputation in this area," he said. This summer he plans to travel in Europe and attend four programs in mathematics at the University of Bonn, Oxford University, Schloss Dagstuhl – Leibniz Center for Informatics, and the Centre for Advanced Study at the Norwegian Academy of Science and Letters. In the fall, van Doorn will begin postdoctoral research with Thomas Hales, the Andrew Mellon Professor of Mathematics at the University of Pittsburgh. He will collaborate on the formal abstracts project, which is an ambitious effort to specify the statement of mathematical theorems in the Lean proof assistant. "I consider myself a mathematician, and CMU's Philosophy Department has a very nice mix of people applying mathematical tools for philosophical questions. It leads to interesting discussions, and I learn some very interesting applications of mathematics, some of which you won't find in a mathematics department," van Doorn said. Pictured above is Floris van Doorn at the Department of Philosophy Diploma Ceremony.